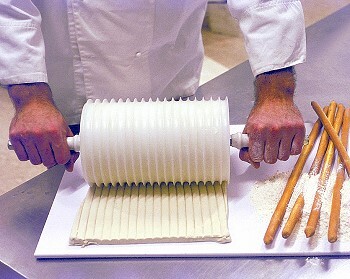 Specialty tool for cutting dough into long breadsticks. This rolling-pin type cutter, cuts sheets of dough into uniform 1/2" (15mm) wide thickness, 3/16" depth. Cuts 12 breadstick at a time. Made of white polyethylene plastic. Professional-grade Baking Tools and World-class Pastry Ingredients. Largest assortment of Tools, Ingredients and Packaging. Internet's oldest bakery supplier, trusted since 1997. Celebrating our 21st Year !